Very well built, takes up little room, easy to use. Quite small interior at only 17 litre capacity - asides from that it's great. 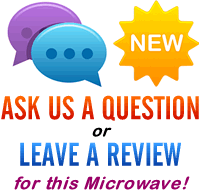 Looking to buy a small, easy to use and reliable solo microwave? The Bosch BOSHMT72M450B is aimed at you - with just two dials, it's exceptionally easy to use, very compact, and works well. The controls are suitable for those who struggle with technology, and as such will be ideal for the elderly - simply adjust the temperature on the upper dial, and then set the time on the lower dial. Overall build quality is very good - it feels very solid, and the stainless steel exterior looks good and will be easy to clean. The timing system goes up to a maximum of 60 minutes, and despite the 17 litre capacity, it still features a 24.5cm diameter removable glass turntable. 5 different power levels are provided, up to a maximum of 800w, which are set by the upper of the two dials. Essentially this silver microwave is a simple and compact solution which will be ideal for the elderly, smaller households, and workplaces. It may be a little too small for larger families, but for those who require an easy method of cooking and heating up food, then you can't go wrong with this Bosch model. 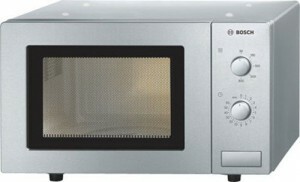 Overall the Bosch HMT72M450B microwave is well constructed, easy to use and looks smart. It's pretty small with a modest 17 litre capacity, but overall works well and we wouldn't hesitate to recommend it.